Home › Social Justice › If It’s a Correctional Facility, What Is Capital Punishment Correcting? If It’s a Correctional Facility, What Is Capital Punishment Correcting? On the morning of May 23, 1701, Captain William Kidd found himself kneeling alongside a motley assortment of unwashed felons in the chapel of London’s notorious Newgate Prison, being lectured by a man of God about the atrophied condition of his immortal soul. In front of Kidd was an empty coffin, propped up as a needless reminder of the fact that he was to be led to his death by hanging within a few hours. While doubtlessly affected, Kidd’s emotions were probably blunted to some degree by the smuggled bottle of rotgut he had downed earlier that morning in an attempt to anesthetize himself for that afternoon’s festivities. After being forced to participate in the ritual acknowledgement of their impending damnation, Kidd and his unfortunate piratical fellows were led down to the banks of the River Thames and the ever so subtly named Execution Dock. Reserved specifically for those convicted of piracy, Execution Dock was slightly crueler and more unusual than your average scaffold as the hangings were performed with a shortened rope designed not to break the neck of the prisoner, ensuring a slow and agonizing death by strangulation. Fast forward to tonight. 312 years later, in a state penitentiary in Jackson, Georgia, Warren Hill is given some Ativan to calm him down before being strapped to a gurney and wheeled into a public viewing room where he will be injected with a lethal dose of pentobarbitol and executed. Shortly after being given the sedative, Hill is informed that the 11th Circuit Court of Appeals has granted him a stay of execution and that he will not be killed. Not tonight. Maybe tomorrow. Probably at some point in the near future. But not tonight. This is the second time in less than eight months that Hill has been pulled back from the brink of death by an 11th hour intervention by the courts. There is a good chance that it won’t be his last. Warren Hill was 30 minutes away from being strapped into one of these and facing execution, again. What makes the case of Warren Hill even more draconian and inhumane than your typical pending execution is that Warren Hill is mentally retarded. Hill has been diagnosed by numerous doctors as suffering from mild mental retardation, registering at the uppermost range of the diagnostic scale with an IQ of 70. While functioning at levels lower than 97% of the general population, individuals with mild mental retardation do not fit the typical mold of what the general public envisions when they think of the developmentally disabled. They are generally capable of holding down jobs requiring unskilled or semi-skilled labor, frequently get married and raise children, and are more similar in many ways to people of normal intelligence than they are to those suffering from moderate to severe mental retardation. The problems for this particularly subset of the population center around social interaction and development, along with the ability to problem solve and regulate impulses. The 53-year old was originally given a life sentence for the murder of his 18-year old girlfriend, but was moved on up to death row after he killed a fellow inmate John Handspike in 1990 after, witnesses say, Handspike made a number or threatening sexual gestures towards Hill. Three forensic psychiatrists who testified at an evidentiary hearing in 2000 stating that Hill was fully mentally capable and should receive the death penalty have recently come out as saying that they made a mistake in providing their diagnosis and that they were rushed during the original trial. These psychiatrists join 6 others who have openly given their medical opinion that Hill is developmentally disabled, along with a chorus of notable civil rights advocates that include none other than Jimmy and Rosalyn Carter, who have requested on multiple occasions that the parole board commute Mr. Hill’s death sentence. However, that has proven to be a particularly tall order in Georgia as it is the only state in the union that places the burden of proof entirely on the defendant to prove beyond a reasonable doubt that he or she is mentally retarded. Thus, we are stuck in a situation where almost everyone, including the judges overseeing the case, knows that Hill is mentally retarded, but find themselves unable to meet the inappropriately high burden of proof placed upon the defendant by Georgia law. One would hope that this latest stay of execution by the 11th Circuit Court of Appeals will turn into a permanent one, but Georgia’s track record isn’t too encouraging. The last prisoner that the State of Georgia executed was a man named Troy Davis who was accused of killing a police officer in 1989, but who maintained his innocence until his death and against whom there was no physical or DNA evidence. After refusing his last meal and the Ativan the prison tried to give him, Davis told the prison staff “May God have mercy on your souls. May God bless your souls,” before addressing the family of the deceased officer, apologizing for their loss but letting them know that he was not responsible for it. 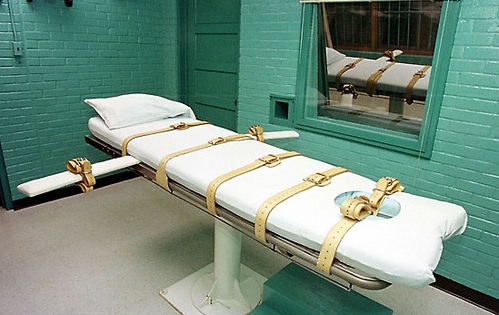 Ultimately the barbarism of the death penalty undermines any attempt to sanitize it. There is little difference between being hung from the gallows, being electrocuted and being pumped full of toxic chemicals. The end result is always the same and any amenities we provide the prisoner are more for our benefit than theirs. We give them last meals and sedatives because it allows us to rationalize our abandonment of compassion and humanity in the name of some outmoded medieval idea of justice. 11 years ago last month, the State of Arkansas put Ricky Ray Rector to death by lethal injection. Mr. Rector, who was obese and on a number of antipsychotic medications at the time, proved unusually resistant to the lethal injections and it took over 50 minutes for prison doctors to find a suitable vein and put him out of his misery. Ricky Ray Rector did in fact kill a police officer and one other person in cold blood, but unlike Troy Davis, his guilt was never in question. As in Warren Hill’s case, Rector’s capacity to stand trial was at stake as he had mutilated the frontal lobe of his brain in a suicide attempt immediately following the shootings. The courts did find that Rector was competent to stand trial and was convicted and sentenced to death. At his request, Mr. Rector’s last meal consisted of steak, fried chicken, cherry kool aid and some pecan pie. He ate the steak and the chicken and drank the kool aid, but left the pecan pie untouched. As he was being led out of his cell for the last time to face lethal injection, the guard asked his charge why he hadn’t eaten his pecan pie. Rector told him he was saving it for later. 1Historical background on the death of William Kidd comes from Kelly Grovier’s The Gaol: The Story of Newgate, London’s Most Notorious Prison.